Crafting in Yoohooville: I want an Osgood Scarf! 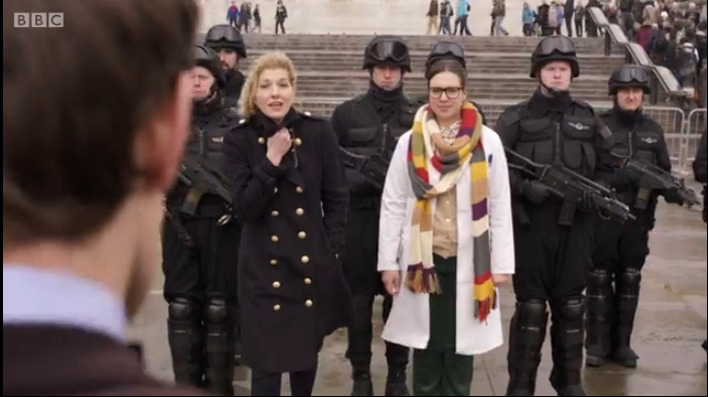 I want an Osgood scarf! No, it is NOT the fourth Doctor's scarf. I think she's supposed to be a knitter and made it in homage to the Doctor! Its stockinette, I'm thinking 20-25 stitches in the round, and fringe at the ends. for the striping pattern, maybe 8-10 feet long rather than the 18 feet the 4th Doctor's scarf is? Most of the time, I'm screaming at Steven Moffat, but today, I thank him for doing an astoundingly amazing job on the 50th Anniversary of Doctor Who show.